← Rudraksha Yoga wishes everybody Happy Deepavali: Lord! take us from darkness to the Light! Devi, Shining with Beauty: Shridevi Lalita Maha Tripurasundari. This is a Vagratha article the exposes the meaning of a word or a phrase from multiple angles. First of all, let us pray Shridevi for her blessing to clearly understand the meaning of the word Devi. Meaning: We salute Shridevi Narayani who is also Shridevi Parvati, who is the Ultimate Refuge for all. What is the meaning of the word Devi? Let us understand. Devi is a Sanskrit word of feminine gender coming from the root Div meaning to shine or to be splendid, beautiful. So, the word Devi describes two most important attributes of Shridevi: 1. She shines. 2. She is beautiful. Combining the two, we can get an idea on who is Shridevi and how does She look like based on the meaning of the word Devi. Devi means the lady who shines with beauty. Esoteric Meaning #1: Devi means a divinely beautiful lady who shines herself. It further means Shri Devi does not need any external light to show herself. She is self -illuminated divine being. Further, She illuminates everything so as to function. e.g. our heart and brain cannot function without her wish or power. So, Devi means Universal Self that shines itself. Esoteric Meaning #2: Devi also means the beautiful lady who shines everything. In other words, Devi throws her light on everything so that we can know that it exists. Without Devi’s light, we cannot perceive or understand anything. It means Devi gives us knowledge. This is her power of Shri Mahasaraswati who is the presiding deity of knowledge. Esoteric Meaning #3: Devi’s shines with inherent beauty. The beauty indicates all good things or pleasing things in life. 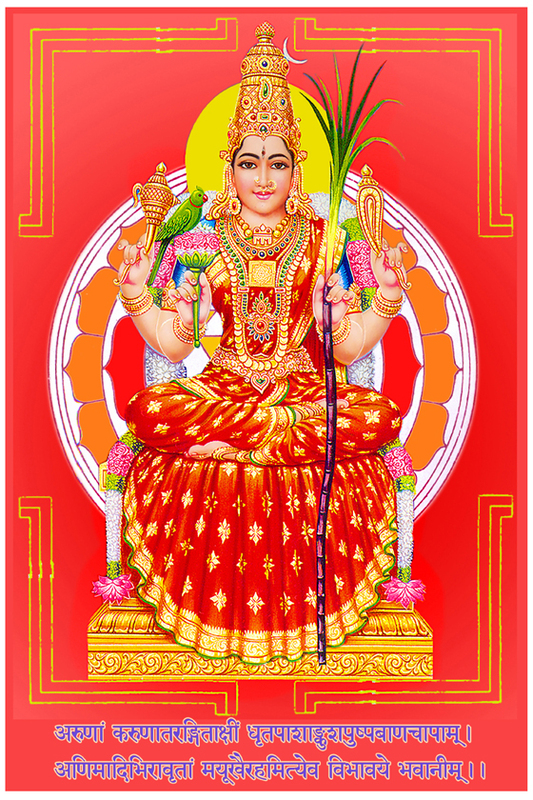 So, the beauty represents Shri Mahalakshmi aspect of Shridevi who presides beauty, wealth and all auspicious things. The cool beauty of Shridevi is boon-giving(varada) and reassurance of fearlessness(abhaya) to all her devotees. Esoteric Meaning #4: Devi’s brilliant shining implies her power(Shakti) to wipe out evils or wrong-doers and provides fearless refuge to her devotees. Just like Sun light if the intensity of light is concentrated it becomes fire. In other words, Shridevi is both light and fire. The shining light of Shridevi turns into fire when shes deal with evils. So, the word Devi indicates Shri Mahakali aspect of Shridevi. Shridevi Mahakali rules the unmatched extreme power that erases all evils without a trace. Esoteric Meaning #5: From meanings 2-4 above, the word Devi means combined power of three aspects Mahakali, Mahalakshmi and Mahasaraswati, which is Great Goddess Durga. Esoteric Meaning #6: Since Devi shines with her own light, She is capable of destroying our ignorance with her brilliant light of knowledge. So, Devi word indicates the Guru attribute of Shridevi who eliminates our ignorance and guides our Individual Self to liberation from vicious circle of birth and death. How can we understand Shridevi clearly? By connecting to Shridevi and experiencing some of her divine powers by traditional yoga. This gives us the first hand direct knowledge of the power of dust of lotus feet of Shridevi. Let us pray Shridevi to shower kind Her Grace to connect to her lotus feet. Meaning: Let us pray the primordial power(Shridevi) always (for Her kind Grace). This entry was posted in Shridevi, Vagartha and tagged about devi, meaning of devi, meaning of word devi, who is devi. Bookmark the permalink. Thanks for comment. We are too busy to write more articles these days. Meanwhile, we suggest our esteemed readers to go through earlier posts.